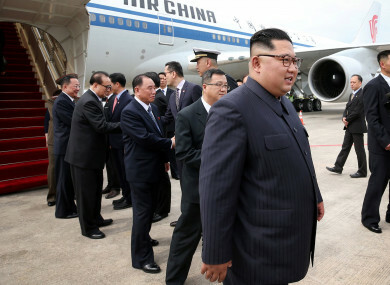 NORTH KOREAN LEADER Kim Jong Un and Donald Trump arrived in Singapore today for an unprecedented summit, with Pyongyang’s nuclear arsenal at the top of the agenda and the US president calling it a “one-time shot” at peace. It is an extraordinary turnaround from the tensions of last year, when Kim accelerated his weapons programmes – earning the North more sets of UN Security Council sanctions – and the two men traded personal insults and threats of war. Authorities imposed tight security around the Singapore summit venue and the luxury hotels where the leaders were to stay – including installing extra pot plants outside Kim’s accommodation to obstruct reporters’ views. Washington is demanding the complete, verifiable and irreversible denuclearisation of the North, while Pyongyang has so far only made public pledges of its commitment to the denuclearisation of the peninsula – a term open to wide interpretation – while seeking security guarantees. But the value of the event – long sought by the North, and which Trump apparently impulsively agreed to in March, reportedly without consulting his advisers – has been called into question. The North invaded the South in 1950 and the ensuing war pitted US-led UN troops backing Seoul against Pyongyang’s forces which were aided by China. The conflict ended in an armistice which sealed the division of the peninsula. Email “'One-time shot': Kim and Trump arrive in Singapore for high stakes meeting”. Feedback on “'One-time shot': Kim and Trump arrive in Singapore for high stakes meeting”.